1. Solve problems. Physicians must solve their patients’ chief complaints. Don’t get distracted by one-size-fits-all algorithms and computer prompts. Treat the patient, not the computer, not the insurance company. 2. Return calls. If a patient calls, call them back ASAP. Return emails, labs, and test results the same day. Sooner is better. Patients get anxious when left waiting. 3. Start on time. Respect your patients’ time by staying on schedule. If you run late, apologize. Better yet, offer a $5 gift card for a cup of coffee. When I run late, my patients choose handmade soap from a giant wicker basket. What will you do? 4. Stay put. If you want patients to stop doctor shopping, then doctors should stop job hopping. Jumping from one clinic to another isn’t a winning strategy for a loyal following. Find or create an ideal clinic and stay there. 5. Have fun. Nobody wants to see a doctor who is stressed and depressed. Smile. Laugh. Tell a joke. Lighten up. Host a patient appreciation day every once in a while and hand out balloons and chocolates—just because! 6. Research & refer. If you can’t solve a problem, research and refer to someone who can. Reach beyond allopathic medicine when needed. Refer to acupuncturists, massage therapists, and other health professionals. Replace, “We have nothing left to offer you” with “I’d like you to see my colleague who has had some incredible success treating your condition.” Never abandon your patients to Dr. Google. 7. Do house calls. You’ll basically stand out as the town hero when you treat a patient in their home. Try it weekly—even monthly. I bet you’ll love it! Pamela Wible, M.D., is a physician entrepreneur and pioneer of the ideal medical care movement. She teaches physicians cutting-edge business strategies at her biannual physician teleseminars & retreats. Join us anytime! Medical students are welcomed. 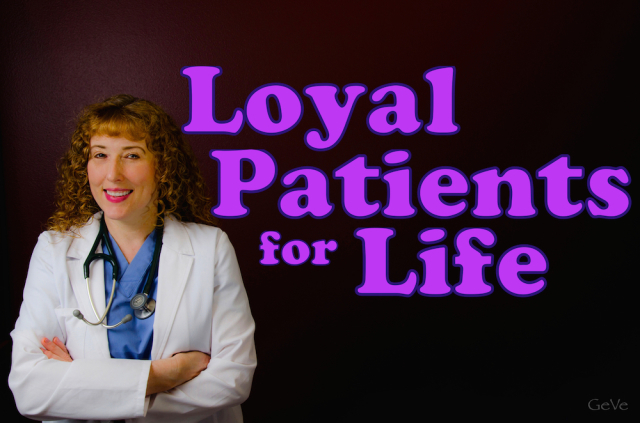 Dr. Pamela, While I am enthusiastic about your genuine friendly intentions, I cannot agree that patients become “loyal” in a system of apology, incentives and gratification. You seem to be spreading a “positive psychology” virus. Patients are not three years old. True loyalty comes from mature relating, not gratification. If I am late, I offer something that a mature adult can understand and then I listen for anything they might let me know indirectly about the impact of the hold up, and if I hear something more, I acknowledge it again and open the door for more feedback from them – adult to adult. If someone can’t handle being an adult with me – and are not responsive to my genuine intention to treat them, maybe they need balloons and soap and I’m not the right fit for them. My patients are mature, capable, responsible individuals with a little bit of gratitude for the hard work we do together – much like myself. I agree that a mature adult relationship (outside of pediatrics) is the ultimate basis of the core foundational unit in health care. But I have learned from experience that these strategies work. I do these things naturally so they are not canned or disingenuous. Many in health care have forgotten the value of random acts of kindness. Caring for some of my patients has been extended for 30 days with their helium filled smiley-face balloon smiling at them on their bedroom ceiling long after our appointment. Don’t undervalue the meaning of what could look like child’s play. Healing comes in many forms. The most important thing is to be congruent with oneself as a healer and meet patients where they are at. Patch Adams wears a clown nose. Most docs wouldn’t do that. But he has healed many souls with that simple playful approach. As an aside I am a very conservative doctor in my approach to medical care. I am by the book and totally OCD. And yes, sometimes I put on a party hat. And if it helps my patients then I am willing to do it. I agree with Debra, I personally might feel put off but points three and five but that’s just me and where I’m at right now. I think the gist of Debra’s comment and Pamela’s response is that doctor’s need to be themselves (whether serious or playful at heart) and patients need to find a doctor who’s a good fit personality wise. Aside from an intimate relationship, one’s relationship with their doctor is potentially the next most personal so it’s not like a doctor can be everything to everybody. Not every doctor can pull off “have fun” in the way Pamela does but my impression is that all she is asking of herself and other doctors is that they do, in their own way, something better than the dull, depressed, angry and/or rushed interactions that many doctors have with their patients. You got it! And ow it’s time for my favorite song! —> https://www.youtube.com/watch?v=84GEk4RUY3s LET’S DANCE! Oh, I need to have this playing in my office!!! One of my adult patients used his paper gown as a cape; too funny to walk in and see him in his undies and a Superman cape! One young child listed off every symptom he had and told me his diagnosis; he was exactly right! The approach should fit the patient. I also know that most educated adults have zero clue what we are trying to explain, but they are too nervous to say so. I’m lighthearted, and patients tell me things no one else knows. It’s a joy and I feel blessed to have their trust. SO so so happy for you Jennifer!!!! I know its all basic stuff, but sometimes easy to forget when you are trying to stay on time. Wow! I’m so glad you take the time to do those things! Wonderful reminders that I will print and keep at my desk. As a patient I would like to add that it is also nice when doctors are open to information and treatments that a patient brings in. Be it a conventional or an unconventional treatment I think doctors should be open and curious. Too many doctors dismiss anything the patient finds online or from patient groups rather than taking time to educate themselves (on their own time and not during the appointment). The doctor may decide the treatment is too risky or disagree with the patient but if it is done in a respectful way I think the doctor can continue to have the patient for life. Wow, your insight is both exciting and frustrating.. I wish I could email this to my medical group. I saw a female Dr. last week. I was her first appt of the day. I came in at the time the nurse told me 8:00am. I filled out my paperwork and then was ushered in the exam room. About 20 minutes in the nurse tells me that the doctor is always around 30 minutes late. So I sat and waited. At 9:30 she finally comes in. I went in absolved to ask for certain tests and tell her my reason to be there. Mind you I was not presenting as a sick patient. I also told her I would like certain blood tests to confirm this. I got an appt to have a colonoscopy, and a stern warning that any other natural treatment for menopause was fraudulent in her opinion. I pay 1000.00 per month for insurance for our family. It was a defeating appt at best. Oh and she said to knock out the carbs I was eating. Hmm. I want to go to a Dr. in private practice. But I pay for this insurance and I have to go to their doctors. The one doctor I found in this group that is supposed to be good like you, cannot see any new patients till January 2016!!!!!! What is wrong with this? Wouldn’t the medical group notice that only a few of their doctors are capable of having a caring attitude? You are a rare doctor. I am sure doctors come in contact with difficult patients, but should the doctor assume the role of resistance also? Should all patients be treated like they are a bother? That is when the doctor forgets the reason they were attracted to their professions. The joy in being the best they can be… The art of helping people. essentially all doctors went into medicine for the right reasons. They all wanted to care and help people and then look what happens: https://www.idealmedicalcare.org/student_testimonials.php LISTEN AT minute 3:00 and read the third quote by Scott Lowman, a fourth-year medical student. And let her know what the experience of being with her was like for you. Maybe you will be the one who jolts her out of her torment. Pamela, as usual a wonderful topic, and one close to my heart or skin right now. I shall look for someone who has those same feelings and attitude. I just launched my solo Community Supported Health Care practice in October. Had two patients come in yesterday for minor problems. Were so pleased they wrote $825 checks for full year memberships!! Saw a woman last week who has had a migraine for a year and a half. She walked in the door, sighed, relaxed and expressed gratitude for the quiet and indirect lighting. Pamela’s 7 tips are right on. This is what our patients want, and what we want when we are patients. The people who say this can’t be done are just plain wrong. We are doing it. And we and our patients are loving it. I love you Diane! My hero! I am a human, who used to have good doctors… I am in my 50’s. I have the same general doc for his life time. I had my gyns for over 30 years and my cardio guy. I out lived all of them. I still have the same dentist I have had for many years, skilled , professional and nice. Why – they cared about people, they acted human, they were responsible humans. They loved or at least liked what they were doing. They treated you with respect. I am told to suffer and get used to it …. someday it will stop. NYS doctors have changed they need to learn to be professional at a minimum. I wonder what has changed …. maybe some of these doctors are on the medications with the unpredictable behavioral side effects….. That’s like a big can of worms… of what will be our new norm of acceptable. me i suffer with no help. I would love to find a doctor that shares loyalty. Pay before services rendered…. you never know what they code. where else do we do business like this? Pay up front? and I am supposed to trust them? Forced to have testing done at their office… no choice… Bloodwork , sonos etc. ( I want an uninterested party doing the test) Isn’t this wrong? How about forced to have a sono done at their office before you even see the doctor for the very first time…? I would appreciate carbon copies of test results . I would appreciate when I request COMPLETE records that is what I get. I don’t understand why doctors are so reluctant to “call an expert doctor” on behalf of a patient who needs help. I have mitochondrial disease and a short-chain fatty acid oxidation defect. I am aware that the expert doctors are happy to share their experience, yet when I ask my doc to please call, he/she won’t do it. I am aware that PCP docs don’t like mito patients. What is the patient supposed to do? We can’t get rid of our disease, we don’t even get a day off, or a nice weekend. Why are our doctors so unhelpful?